Get in touch with us via the form below, or call us at 1-800-692-9273. PureTrim Customer Service will get back to you within 1 business day! 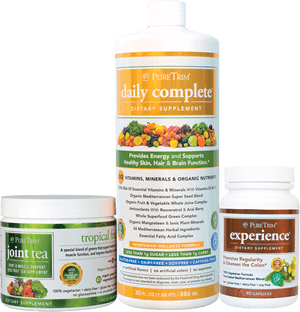 Choose your favorite PureTrim products with the menu to the left and achieve vibrant health! Please enter your referrer's store name! Make 2019 the year you get your health back! Improve your flexibility & mobility! Everything you need to get your joints feeling good again! These statements have not been evaluated by the Food and Drug Administration. This product is not intended to diagnose, treat, cure, or prevent any disease. PureTrim® must be used with diet and exercise. Weight loss results vary depending on the individual. For our in-house preliminary study, weight loss averaged 1-2 pounds per week.